The UK Ministry of Defense will spend £17 million on a fleet of sea drones after signing a contract with French arms giant Thales. The drones will be developed with the MoD’s French counterpart, the Direction Générale de l’Armement (DGA). The MoD claims the vehicles will be used mainly for mine clearance. The initiative aims to develop two kinds of unmanned maritime vehicle – a submarine and a surface craft – to meet the operational criteria of both nations. While headed by Thales, the consortium which will work on the project includes British defense firm BAE. Philip Dunne, a UK defense minister, said: “The development of unmanned maritime systems is a new and exciting area for both the UK and France. Head of UK Defense Materials, Bernard Gray, said: “Both the UK and France recognize the potential for unmanned vehicles to counter the threat of sea-mines. 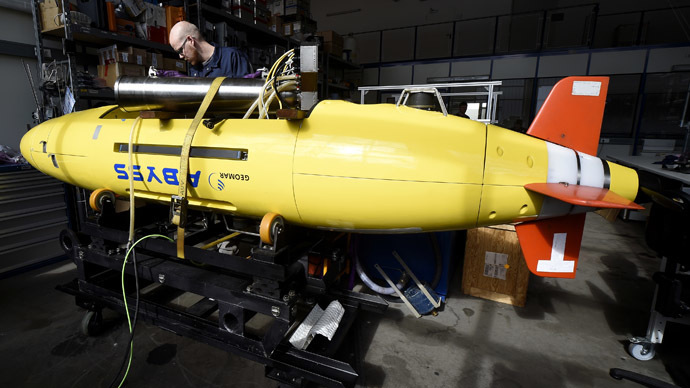 It is not clear whether the new systems will augment or replace the Royal Navy’s existing fleet of 18 Seafox Unmanned Underwater Vehicles (UUVs) based at Whale Island, Portsmouth, which have seen service in the Straits of Hormuz. With a particular focus on the drones’ anti-mine role, there is little mention of the technology’s offensive capabilities, as demonstrated by Unmanned Aerial Vehicles (UAVs) in Afghanistan. However a report by the Defense Science and Technology Laboratory (DSTL) seen by the Guardian newspaper in 2012 does touch on the combat potential of maritime drones. In the report, formerly head of the MoD's development, concepts and doctrine center Rear Admiral Chris Parry said: “The whole area of UUVs is about to explode … it could be as big in the maritime sector as it is in airspace. Speaking to RT, Jordan Jones, 28, who served as a non-commissioned Royal Navy warfare specialist on frigates and destroyers between 2007 and 2011, said he found it incredible there was always money to be found for new military innovations. Jones was skeptical of claims that the role of sea drones would be limited to mine clearance operations.